The foundation stone of Christ Church was laid on 4 May 1897; and the Bishop of St. Asaph consecrated the completed building on Tuesday, 28 September 1899. 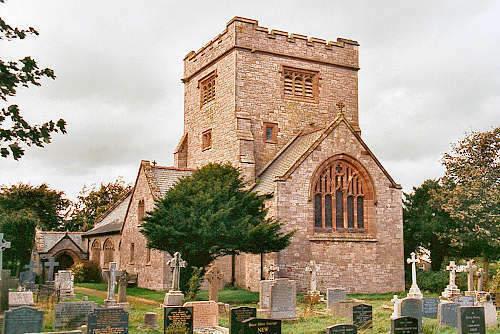 Christ Church, Brynymaen, built to the honour and glory of God and to the dear memory of Charles Frost, was consecrated by the Bishop of St. Asaph on Tuesday morning, the event very naturally proving one of wide-spread interest in the district. This handsomely designed and substantially built church, which will take rank as one of the most magnificent in the diocese, was erected by Mrs Charles Frost, of Min-y-don, a lady well-known for her generous and liberal support of religious work, to perpetuate the memory of her late husband, Mr Charles Frost, whose mortal remains lie buried within what is now the church-yard. ..... Christ Church forms a striking feature in one of the finest landscapes in Wales. It stands, at an altitude of something like 840 feet above the level of the sea, upon a broad plateau, and is distant about a mile and a half from Colwyn Bay, from which town it is separated by that lovely belt of woodland, the far-famed Pwllychrochan Woods. It is reached by a typical country road, which an economic local authority has skilfully succeeded in neglecting, but, whatever the discomforts of travelling that way may be, the visitor is amply rewarded on reaching the level ground. The pure, bracing breezes are laden with health-giving properties, whilst the soul-enchanting scene of rare natural beauty which presents itself to the view is one which lingers long in the memory." The new parish of Bryn y Maen was created on 15 May 1900. It comprises parts of the parishes of Colwyn; Colwyn Bay; Llaneilian, and Llansanffraid Glan Conwy. In 1937, part of the township of Mochdre, from the parish of Llandrillo yn Rhos, was added to Bryn y Maen. For family history information about the church and parish, visit the GenUKI Bryn y Maen page.